Over the course of the last several years, our marketing team has been on a mission to find business value from data using analytics. In my role, I focus on demand generation via online channels, both inbound and outbound. As our web footprint has grown, so has our data and its irrevocable bond with digital marketing. As digital marketers, big data analytics is our best friend because we receive big data - both structured and unstructured - from web activities across dozens of touchpoints. We certainly recognize the potential of the data, so it is imperative that we turn this digital data into business value. There are a few important ways we use the big data analytics to enhance our digital marketing. Search: We are able to collect and utilize behavior from our largest traffic source. Using SAS solutions, we combine above median usage metrics – recency, depth, duration, high value content – with other online conversions to identify a customer acquisition opportunity or trigger alerts for our current customer marketing efforts. This is a big deal for us. I still wish we had keywords – I criticized Google for restricting them here a little while back – but what we have is working for us. Lead Nurturing: Big data analytics is a boon for lead nurturing. Not only does it enhance what we have been doing for a while now , but it gives us capabilities we did not have before. For example: By enhancing outbound nurture emails with web behavior and topics of interest, you become more proficient with your targeting. Can you tell if I am interested in ‘digital marketing' or ‘big data analytics' by the download of one white paper or report? We have found that by adding metadata and URL data into the equation, we can pinpoint this much better. This approach works extremely well for both customer acquisition and customer marketing campaigns. Descriptive Analytics & eCommerce: I am still new to the eCommerce space, but there is some siginificant opportunity for big data analytics here. When you really try to improve customer experience across multiple customer touchpoints, using web analytics (we use SAS Adaptive Customer Experience) provides you descriptive examples of the customer journey. For example, it would have been guesswork to identify all of the ‘steps’ in a customer’s online purchase. Instead we used data mining techniques to pull together web behavior, offline activity and data from chat/inbound inquiries to tell stories about what customers needed and wanted from this experience. This provides insights for - among other things - UI design, content requirements, offer management and conversion strategy. 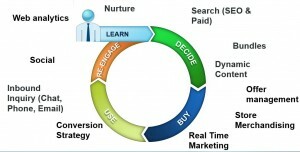 I tried to visualize it here, but it doesn’t do true justice to the rigor that went into the customer journey exercise. Do you have any 'big data analytics' stories that have helped you become better digital marketers?